Whenever I let bananas get a little too ripe, I stick them in the freezer and wait for an opportune moment to make banana bread. 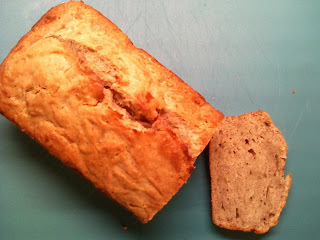 Banana bread is definitely one of my ‘specialties’ (if someone who bakes for one can be said to have specialties), and I’ve mostly used The Joy of Cooking’s quick bread recipe in the past. However, I noticed the last time I baked it that it didn’t taste especially banana-y (made up word alert!). So when the urge to late-night bake struck in the early hours and I also conveniently found four frozen bananas in my fridge, I decided to go hunting for a new, improved banana bread recipe. As we all know, the internet is our friend, so I browsed on a couple of cooking sites until I came upon a recipe that looked promising. Of course, I did make some modifications, but as long as it turns out all right, you’re allowed to do that. So say I, master of my own kitchen. Or perhaps, mistress thereof. Preheat oven to 350°F (I wanted a moist loaf, so I lowered the temperature to 330°F, and baked it longer). Lightly grease a 9x5 or 8x4 inch loaf pan. In a large bowl, combine flour, baking soda, salt and spices. In a separate bowl, cream together butter and sugar. Stir in eggs, vanilla and mashed bananas until well blended. Add banana mixture to flour mixture; stir only enough to moisten. Pour batter into prepared loaf pan. Bake in preheated oven for an hour and ten minutes, or until a toothpick inserted into center of the loaf comes out clean. Let bread cool in pan for 10 minutes, and then turn out onto a wire rack (I don’t have a wire rack, so it just stays in the pan for a while…no ill effects noted). Oh, it’s good. Very moist. But delicious nonetheless. Not the crumbling kind, and very banana-y as hoped for. Now go on…make some yourself! This looks amazingly delicious! I'm going to attempt it one of these days!